Cultus Lake has been shrouded in mystery and lore perpetuated by stories handed down by Chilliwack Indians—accounts of supernatural monsters, spiritual quests, deep underground rivers, and the like. Though a weekend at Cultus Lake in the 21st century is far reach from what the natives experienced many years ago, it’s not difficult to see how such ethereal and powerful stories emerged from such a beautiful place. The lake is situated in the transition zone between the Coastal Western Hemlock and Coastal Douglas Fir biogeoclimatic zones. As such, western hemlock dominates the understory along with verdant moss, ferns and a wealth of other wet-climate flora. The thick old-growth forest is home to giant western redcedar, black cottonwood, Sitka spruce, big leaf maple, and more. Truly, it’s like waking up in Narnia. While exploring Cultus Lake Provincial Park, expect to run into the prolific fauna that inhabits it. Blacktail deer, beavers, shrew moles, coyotes, and over 100 species of bird are just some of the wildlife you could encounter. Once the waterpark was built in the mid-1980s, its popularity soared with campers and recreationalists from nearby Vancouver and Seattle. Plenty of summer activities at Cultus Lake. Photo by Tyson Gillard. That said, if you’re looking for solitude, keep moving through. The scene at the lake—especially on the weekends—is lively, vibrant, and full of families. Sharing the experience is a worthy sacrifice when delivering on a child’s dream with waterslides, miniature golf, hikes through ancient old-growth, warm swimming holes, and more. Most campsites and day use areas offer boat ramps, and it’s hard to imagine the lake without a healthy representation of personal water crafts, motorboats, kiteboarders, windsurfers, and swimmers. The lake is full of fish, and anyone interested in trolling or fly fishing will enjoy casting lines at Cultus Lake. Thanks to conservation efforts, the trout population is thriving along with Dolly Varden, and five different types of salmon. The nearby town of Cultus Lake both rents watercraft and sells fishing permits—be sure to get yourself a British Columbia Freshwater Fishing License before you tie a fly on. Additionally, the Cultus Lake Waterpark in town offers rides and attractions to fulfill on almost anyone’s adrenaline quota. From fast-flying steep waterslides, to lazy rivers and more, it’s well worth a trip. The park has a barbecue area, pet watching services, and restaurants. There’s hardly anything that rivals the experience of waking up under a towering cedar then watching the sun slowly illuminate the placid lake as it rises. As stated above, this is an extremely popular place for camping, and it draws crowds from around the Pacific Northwest, so be prepared to cheers your coffee to the camper next door. There are six major campgrounds in the park—two of which are group sites. During the high season between mid-May and early September, these sites can be reserved, though they stay open and fully functioning from late March to early October. It’s possible to stay outside of this date range as well, but some of the amenities like potable water and security might not be available. If you’re looking to simply visit the lake and stay elsewhere, check out Tamihi Creek East Recreation Site and Campground and Allison Pool Recreation Site and Group Campground. Each is located on the Chilliwack River, and they both offer a bit more solitude than those located on the lake. During the summertime, temperatures can soar in the area. Thankfully, the towering trees provide ample shade for most campsites and much of the day use areas, but it’s still hard to find true reprieve outside of the lake. 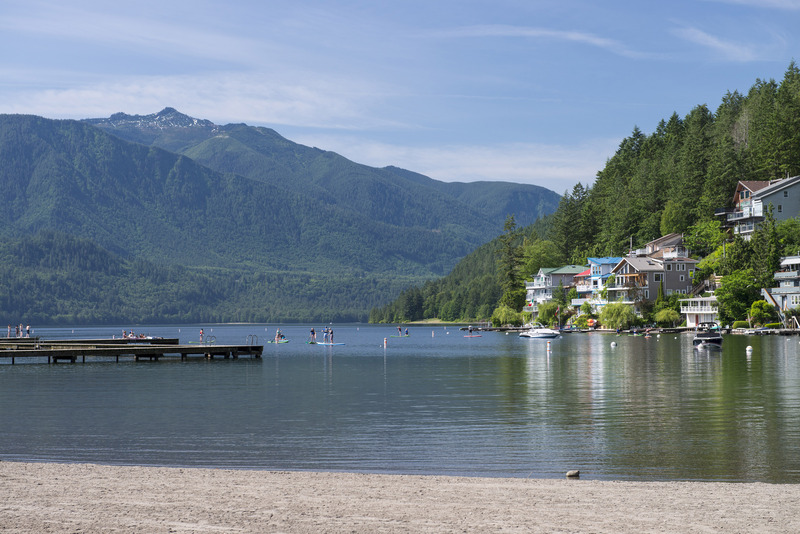 Naturally, May through September experiences the most agreeable weather for visiting Cultus Lake, though because it’s nestled into a temperate rainforest you should always pack a rain jacket. In December, January, and February, it’s not unlikely to see snow, and the park is not adamantly maintained during this time, so unless you have an extremely capable vehicle or don’t mind a little extra adventure, explore elsewhere when it snows. That said, the town of Cultus Lake is still bustling in the wintertime, and fishing and canoeing in adverse weather can provide a new twist to an old pastime. Though your dog will have to stay on a leash at all times and won’t be allowed on most beach areas, it’ll still be welcome. There are several areas set aside for pets: Shale Beach between the Jade Bay boat launch and the Entrance Bay Day Use area, and also in the Shale Beach area between the Maple Bay boat launch and the Maple Bay Day Use area. Within the park, dogs are not allowed in the backcountry in order to help preserve wildlife and to avoid confrontation with bears. Beautiful old-growth forest and warm, freshwater swimming holes. Can be very crowded during the summer months.